The Spanish builder delivers as much as possible in 67 feet. Mas. 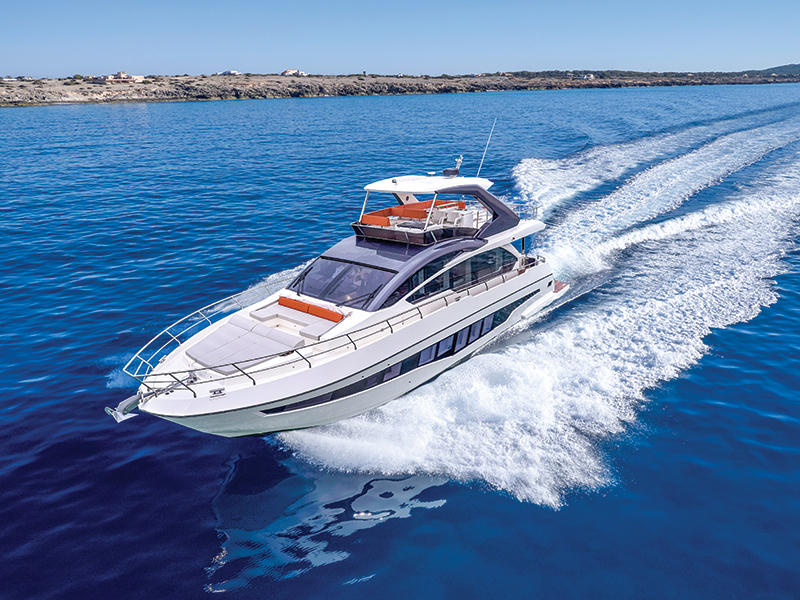 That’s Spanish for more, and that’s what Astondoa tries to deliver with its 66 Flybridge. Just the right size to be operated by owners instead of a captain, the Astondoa 66 Flybridge works well for an experienced owner who wants a lot of yacht but doesn’t necessarily want the cost and responsibility for a captain and maybe a crewmember. Since Flybridge is in the yacht’s model name, we’ll start there. 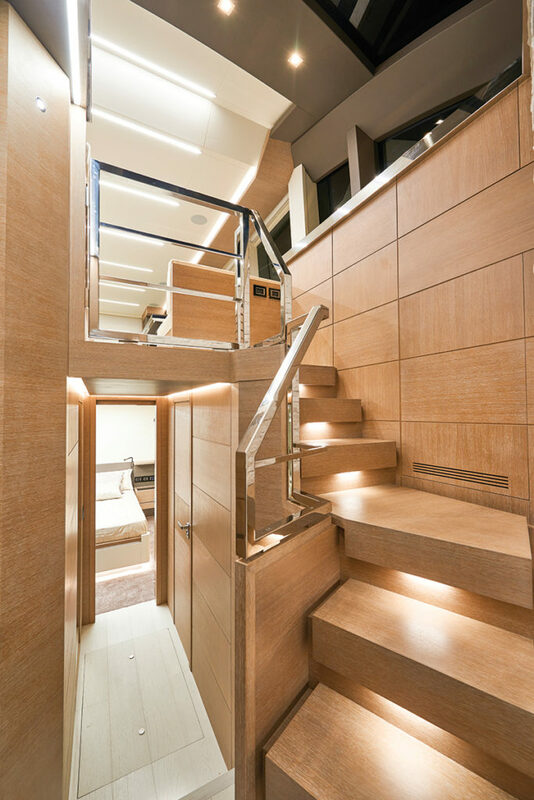 Accessed via a set of stairs from the cockpit, the flybridge is large and social. Two sun lounges occupy the aft third of the space, and immediately forward of them, to starboard, is a C-shaped settee for six that wraps around a table. Forward of that is a U-shaped settee that serves as companion seating for the twin captain’s chairs at the helm. All that adds up to room for approximately 15 people. To keep the party going on the bridge, a wet bar has a sink, a refrigerator/freezer, a grill and plenty of counter space. A hardtop covers the forward two-thirds of the bridge, leaving the aft third open to the sun for the folks on the sun lounges. For versatility, part of the roof slides open. To keep the social angle going, both the pointy and blunt end of the boat have people-pleasing spaces and amenities. Forward is a C-shaped settee for four and a three-person sunpad. A Bimini unfurls to cover the settee. In the cockpit, which is accessed via twin stairways from the swim platform (which serves as the tender launch), a transom settee fronts a table and is protected by the flybridge deck. Three large panes of sliding glass sweep aside to open the inside to the outside and create one large main level space. Inside the doors is the salon, with a sofa to port and a C-shaped settee with a table to starboard. Forward of the sofa is an L-shaped dinette, and opposite that is the galley. Large windows all around bring in natural light, and the windshield overhangs the stairs to below, creating an atrium effect. Viewers of the lower helm, in the main cabin, are going to be reminded of a spaceship’s navigation center. A large flat surface is sloped gently down and houses switches, instrument displays, the engine throttles and thruster controls, and more. On a forward-sloped dash face are twin multifunction displays, twin engine displays, and, between the MFDs, a display for the digital switching system. The engine displays are housed in wings that emanate from the pod and hang in midair. Twin captain’s chairs command the helm space. The flybridge helm is less spaceship- like but still has two large MFDs, engine displays, engine and thruster controls and more. It’s from either of these stations that the captain can operate the 67-footer. 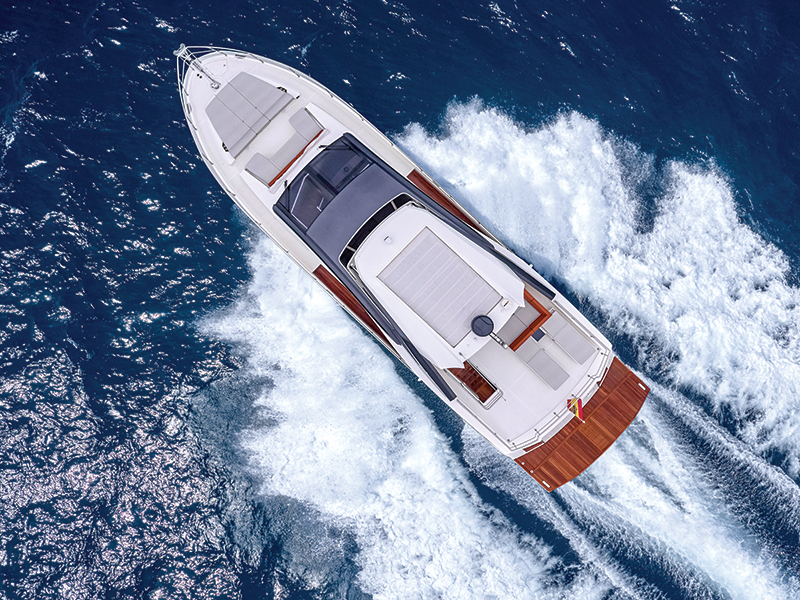 Top speed is 30 to 32 knots, depending on the engine package — twin MAN, Cat and Volvo are options — and the most comfortable and economical cruise speed is from 24 to 26 knots, which yields a range of 300 miles with the 951-gallon fuel capacity. Various configurations are available belowdecks, including four staterooms and four heads or four staterooms and three heads. Either way, the crew quarters provide additional lodging if an owner operates the vessel himself. Using the entire 17 feet, 5 inches of beam, the owner’s stateroom is large and luxurious. A kingsize bed rests on the centerline, a built-in bureau runs along the starboard bulkhead, and a loveseat and another bureau are to port. The head and a walk-in locker are situated between the head of the bed and the engine room. Two more staterooms are forward, and the VIP is in the bow. A watertight door in the transom leads to the crew quarters. 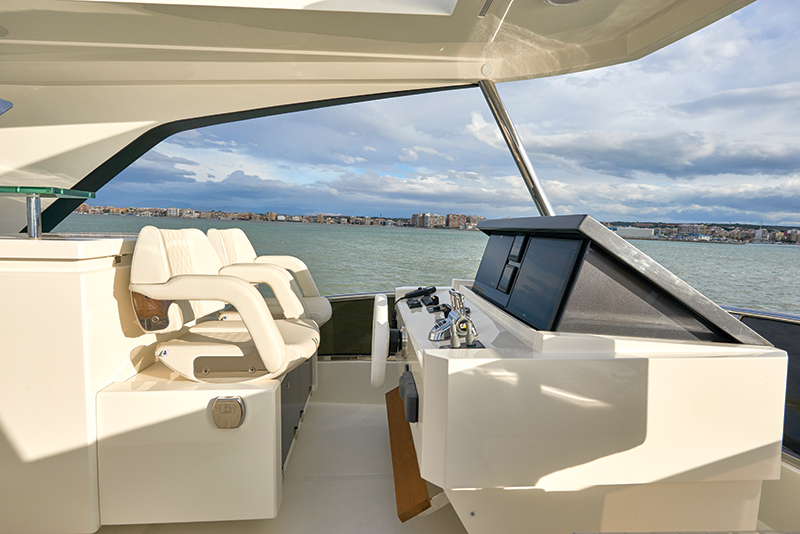 Running almost the length of the hull, on both sides, is a hull window that might be the takeaway feature for many observers of the Astondoa 66 Flybridge. 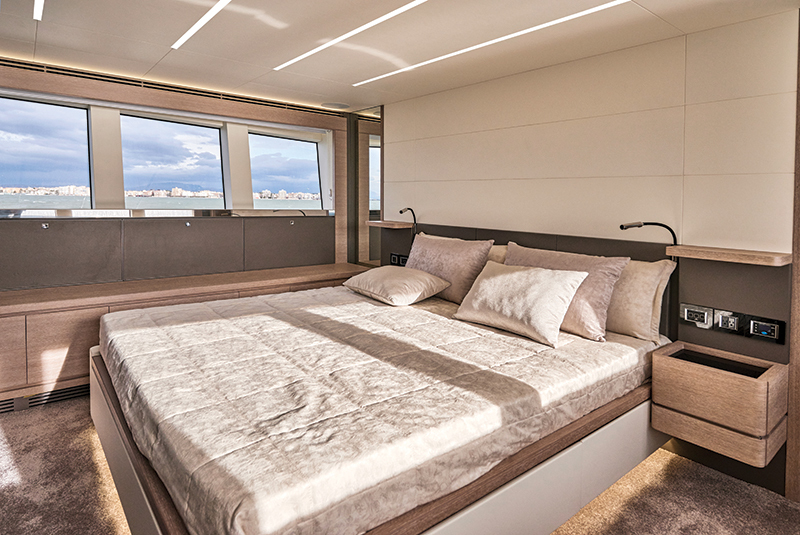 It delivers light to all four staterooms, giving preferential treatment to the amidships master. And why wouldn’t it? LOA 67 ft., 3 in. Beam 17 ft., 5 in.